SummerSlam, one of WWE's Big Four PPV's is just a month away, and the card for the show will slowly start to take shape. One person who many believe may be on his final few matches in the WWE is Brock Lesnar, after Lesnar confirmed this past week that he will be returning to the UFC. Now, as per Dave Meltzer of the Wrestling Observer, Lesnar may be a part of SummerSlam, but is unsure as to who he will face at the show. Lesnar's last WWE appearance was at the Greatest Royal Rumble in April, where he defeated Roman Reigns inside a steel cage. Since then, The Beast hasn't made a WWE appearance, but he did show up at the UFC 226 show, challenging Heavyweight champion Daniel Cormier, to a match inside the octagon. While Lesnar will not face Cormier anytime soon in a UFC ring, as he has to get back in the USADA testing pool, he could show up at a WWE show soon. Meltzer's report states that Lesnar's opponent at SummerSlam is not yet known, but it could be one of Bobby Lashley or Roman Reigns, who will face off against each other at Extreme Rules, this Sunday. What makes this report plausible is the news that Lesnar will make an appearance on the RAW after SummerSlam. Meanwhile, Lesnar's "Advocate" Paul Heyman, is reportedly a writer for RAW and was even a part of the writing staff for the opening segment between Lashley and Reigns this past week on RAW. Extreme Rules is the next PPV, which will be held on 15th July 2018 at the PPG Paints Arena in Pittsburgh, Pennsylvania. 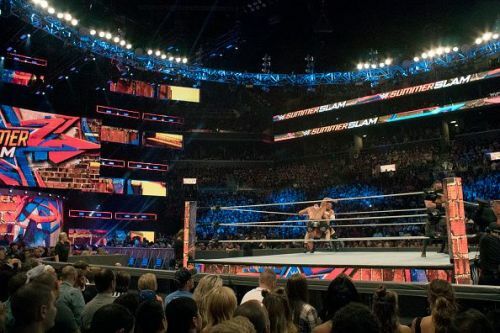 Who do you think Lesnar will face at SummerSlam this year? Sound off in the comments.